Drain-Net is now on Twitter! Our Twitter page is a great forum for you to give us product feedback, ask questions, and get product updates and special web deals. Welcome to the official Drain-Net blog! Most people recognize the value of maintaining our cars, buildings, equipment, and even our own bodies. One reason we do this is because it saves us money in the long run. No one thinks twice about changing your oil every few months because we know that if we don’t, the engine will eventually breakdown and fail. Sadly, too many people take this approach with their drains. They let trash, debris, and grease continue to go down them until the pipes clog and fail. The only option left is to call a plumber to do an emergency fix. Some postpone the inevitable drain clog with dangerous chemicals, but this only puts a band-aid on the problem and can be costly as well. Your plumber can fix your drain clog, but can they prevent it from ever happening again? Drain-Net takes a completely different approach than your plumber. Over the years we have worked with business owners and homeowners to develop the very best in preventative plumbing products. 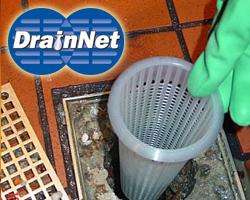 If you are tired of repeatedly calling the plumber and paying for costly cleanings and repairs, try giving us a call or visit www.drain-net.com to learn how you can permanently eliminate your drain problems. In addition to preventing drain clogs, our products can help cure other drain issues such as foul odors, sewer flies, health code violations, and wet slippery floors. If you’re not using a Drain-Net, you might as well be throwing money down the drain. With that said, we would like to welcome you to the official Drain-Net blog! Your friends at Drain-Net will be working to make this the number one internet resource and community for preventative plumbing solutions. And finally, we encourage our readers to make posts about their experiences with drain related issues. Don’t be afraid to post questions so that we or one of our readers can help you out. Thanks for visiting and we will see you again! To share your thoughts and comment on this article, click on the article title.